October 27, 2007-- A national day of anti-war protest, sponsored by a coalition of groups under the umbrella of United For Peace & Justice. Demonstrations occurred in New York City, Chicago, Boston, Philadelphia, Salt Lake City, New Orleans, Jonesborough (Tenn), Los Angeles and San Francisco. Below are moments from the San Francisco event. ............. "Bus Rides Without end- Again!" If you live in Sacramento, the environmentally correct way to participate in an S.F. 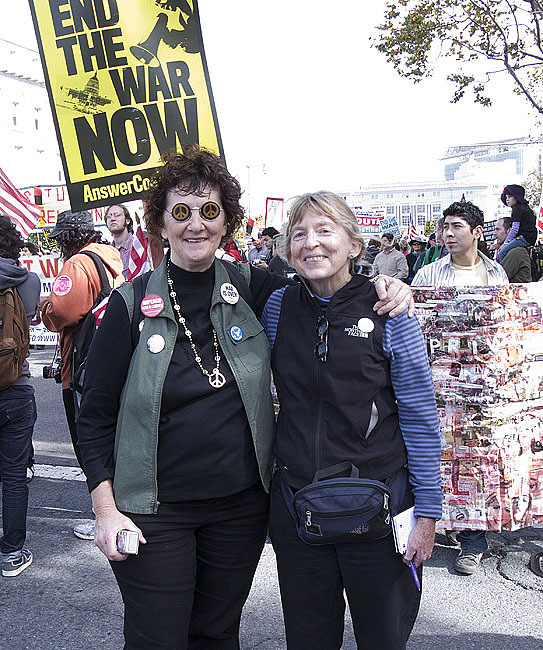 Anti-War march is to travel via the Sacramento/Davis Peace Action bus. The bus varies with every trip-- one exceptional year, it was biodiesel. This year, an extra-large bus had trouble navigating the streets of San Francisco, resulting in several incidents which tested the moral fiber of all on board. But, if you're not tested, how will you know who you are? Thanks to the good leadership of trip organizers, we experienced the truth of Al Gore's statement: "If you want to go fast, go alone, but if you want to go far, go together" We in the peace movement have a long way to go, and it was good that we went together. 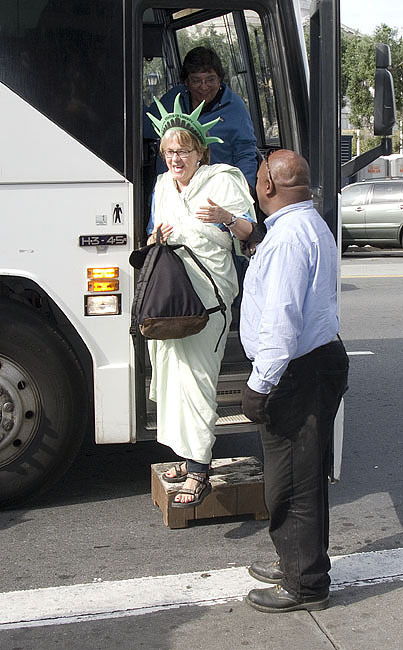 The Stature of Liberty descending from the Sacramento/Davis Peace Action bus upon arrival in San Francisco. U.C. 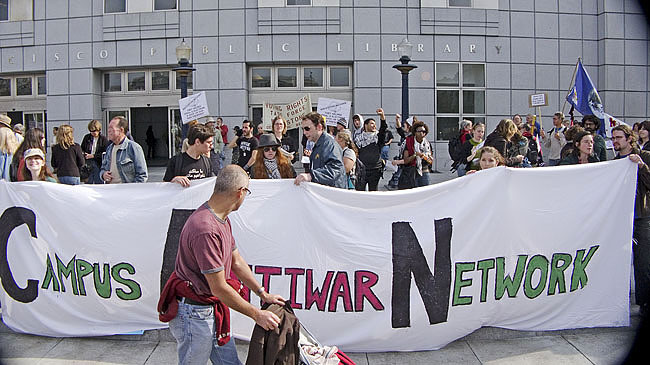 Santa Cruz Campus Anti-War network in demonstration mode. At many anti-war events lately, old-timers have looked at each other and said "Where are the young people?" Well, here they are. The spokesperson for this group gave his speech, then asked for volunteers to step forward and speak their piece (peace?). "You are in a friendly environment," he assured them. "If you are unpolished, it's OK--this is where you learn --- This is what it takes to build a movement!". If this group is representative of the Youth of Today, we can feel some confidence about the future of the Peace movement. Sacramento friends meeting at the start of the march to Dolores Park. 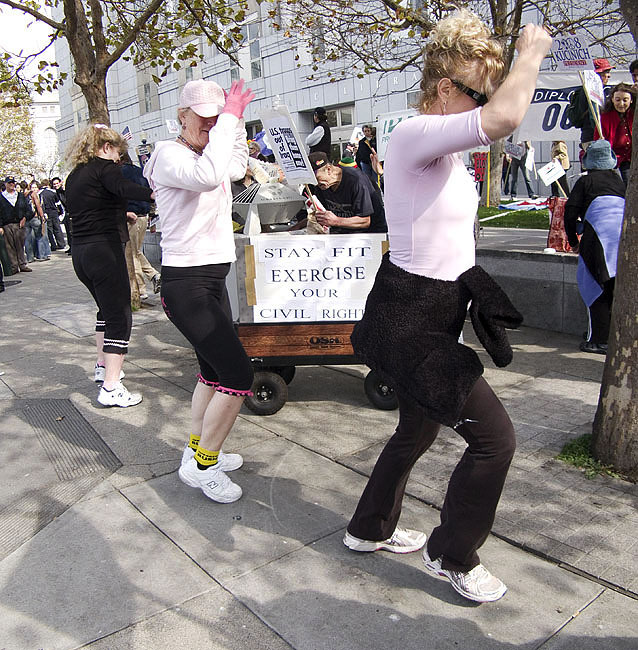 A Peace demonstration takes many forms. 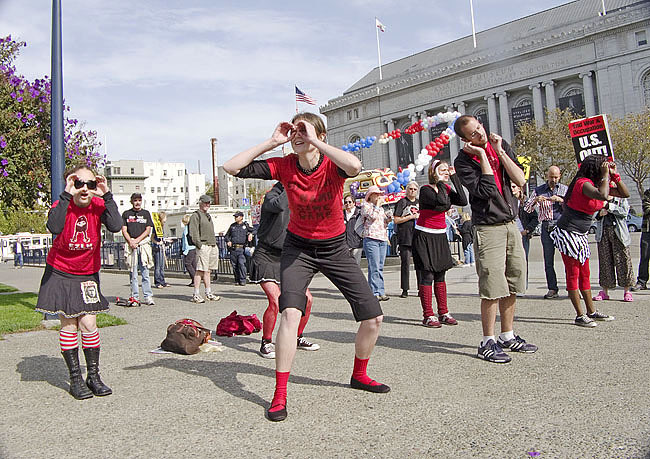 This performance group led anti-war cheers.